During dinner on the Rebuild America Defeat Obama bus, a fascinating discussion evolved amongst our team. Someone said he fears who we have become as a people; a nation in which a majority believes it normal to receive government-handouts. He witnessed people using food stamps to purchase extravagant foods. Someone else chimed in about the huge kiosk in the lobby of his daughter's elementary school encouraging parents to sign up their child for free lunches. Parents who can well afford to feed their child are on the free lunch program. While their examples are anecdotal, my team members conclude that we are rapidly losing the self-reliant individual spirit which has made us great and are trending towards becoming a nation of takers; making government dependency the new normal. Their negative prediction regarding the new America was pretty depressing. But as they spoke, my mind wandered to a story my 84 year old black dad told me about his first job. When dad was around eleven, he and his buddy were shoe-shine boys at the Greyhound Bus station in Baltimore – Saturday night through Sunday morning. Folks, Dad has had an amazing life with numerous achievements, some historical – first black Baltimore City Firefighter of the Year, first black paramedic, a pastor of numerous churches and an author. And yet, when Dad told me, over the phone, about the salesmanship and creativity he and his buddy employed as young entrepreneurs shining shoes, I could hear in his voice the pride and joy he still felt about it. Their deal with management was a dime base pay plus tips. Dad excitedly said, “The money was in the tips.” So he and his buddy made their customer's shoe-shine experience an entertaining show. They twirled their shoe shine brushes high into the air and caught them. They made rhythmic popping sounds with their shoe-shine rag. After the shine, they used a whisk broom to brush down the gentleman's suit. Amazingly, there was always a little something on back of the gentleman's suit requiring a little extra effort to remove. They were always successful and gentlemen were appreciative. On a good weekend, Dad made $1.25. He gave Aunt Nee, who raised him, 50 cents. He purchased a t-shirt. Dad said he bragged to his friends, “I am paying rent and buying my own clothes now.” In Dad's mind, he had become a man. What was the magic ingredient that made Dad feel so good about himself? The answer is individual personal achievement. Despite Obama's four year shock and awe assault demonizing entrepreneurs and individual personal achievement, I still believe a majority of Americans are cut from the same cloth as my dad. 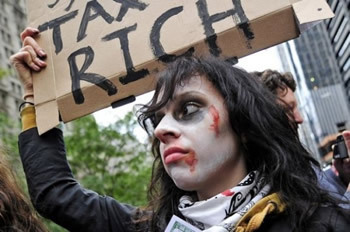 They do not hate the rich nor subscribe to Obama's plan to punish them. They garner pride and self-esteem from earning and paying their own way. Obama's hate-the-rich rhetoric does resonate with a minority – the losers, the ungrateful, lazy and entitlement-junkies who showed up at the Occupy Wall Street protests. Think about that folks, these arrogant idiots have the audacity to demand that government confiscate the profits from entrepreneurs (risk-takers) to redistribute to them. And they call that 'fairness.” The day a majority of Americans side with such low-life scum is the day we cease being a great nation. Obama's reelection campaign is geared to three groups, the clueless, entitlement addicts and racists. A black woman at a gas station was interviewed on Fox News. She said the high fuel prices are having a disastrous effect on her family's well-being, but she is voting for Obama because she agrees with everything he is doing. Folks, I do not mean to be rude, but either this black woman is clueless and/or a racist. I suspect her support of Obama is a combo of both. She is voting for Obama because she is uninformed and he is black like her. This election will define who we are as a people. Are we a nation of entitlement addicts and racists or do we still find great pleasure in using our creativity, ingenuity and will power to pursue our dreams? I believe a majority of Americans are go-getters and dreamers like my dad. Barack Obama your reign of lowering-the-bar of what it means to be an American is over.